Apparently, Easter is much more important than Christmas to Sicilians, who are, of course, 99.9% Catholic. There are processions, reenactments, decorations, celebrations, and ceremonies continually during Holy Week in nearly every village, town, and city on the island. The more famous ones are advertised, televised, and even attended by tour groups. Some of my friends and colleagues and were fortunate to attend one of these on Good Friday in Enna, an ancient (originally Greek) hill town (alt. 3,054 ft.) about 45 minutes to the west of Catania. It was a great time with the combination of the old Greek/Arab city and procession, the company, the weather, the wine . . . . It was especially interesting and rather spooky because the participants cover their faces and heads with pointed hoods that look like the KKK during the main part of the procession. (Two African-American women in our group were taking photos to send home, saying “They’ll never believe it.”) The fifteen “confraternities” (men’s organizations) each have different colored costumes, which are long white robes with various colored capes. 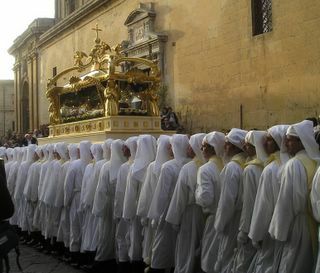 The purpose of the Good Friday procession is to reenact the death and funeral of Christ. They carry a life-size model of the dead Jesus in a glass coffin and another of Mary with knives in her heart. Both of these are carried by long rows of men holding poles which hold the figures up. They are right up against each other and have to walk in lockstep lest one mess up and fifteen men fall like dominoes. The two groups then meet in the cathedral and, when it gets dark, a procession of at least a thousand men and boys in costumes with a band playing an eerie dirge precede them out of the cathedral again and all through the city with candles and crosses. It gave me shivers to experience it. A group of us followed this with a bottle of excellent red wine at the Hotel Sicilia before heading home. Today, on Easter Sunday, three friends and I went to downtown Catania to experience Easter Mass at the cathedral. We started with a couple of rounds of cappucini and chocolate croissants in the Piazza Duomo and then into the church at 10:00. We emerged an hour and fifteen minutes later. In spite of the language difference, of course, the Mass is the same. The bishop himself celebrated it. A couple of typical Italian (or Sicilian) differences--cell phones going off, the sermon complete with LOTS of hand gestures by the bishop, and a Sicilian-style traffic jam at communion time (no lines—just crowd around). The music and ceremony were great. Afterwards, were off to another outdoor cafe for prosecco and then spent some time at the "antique market" which is really a flea market. All in all, a great first Easter in Sicily. I finally made it to Monreale to see the fabulous, famous mosaics of the cathedral, and I was not disappointed. 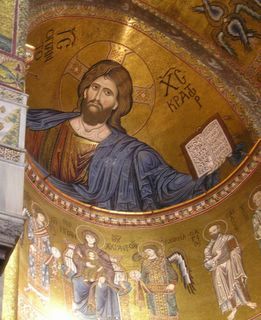 The mosaics themselves cover every possible surface of the church and are dominated by a huge depiction of God in the dome of the main apse (over the altar). Wherever you stand, He's watching you. There is a lot of gold in the mosaics. I cannot begin to imagine their worth, both in material and art value. The walls, arches, and ceilings tell the stories of the Old and New Testament for the lucky churchgoers. The cathedral and mosaics were all constructed during the same hundred-years or so it took to build in the 12th-13th century. The mastermind behind this was William II, a Norman king of Sicily, known as William the Good. I would actually say that he was Very Good, judging by the cathedral, the mosaics, and the cloister. Monreale Cathedral reminds me very much of basilicas and churches I've seen in Cordoba, Spain, and Istanbul, all with wonderfully creative mixtures of Arabic and Byzantine elements with the local cultures' own. They make the heart sing to see them! 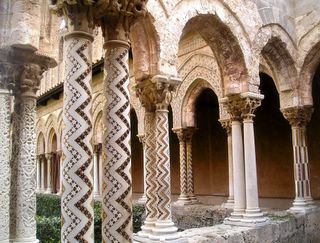 In the case of Monreale, the Romanesque structure has Latin elements of design decorated with Byzantine (Greek) patterns and Arabic arches. Everything is decorated, inside and out. The total effect is almost indescribable but very, very beautiful. Thanks to the traffic jams and unmarked highways of Palermo, which is the only way to get there, we arrived with the cathedral itself closed until after pausa, which ended at 3:30. This turned out to be a good thing, though, because we spent at least an hour being awed by the courtyard with covered walkway, called the cloister, part of the attached monastery. I had no idea that this would be almost better than the mosaics! The perfectly square cloister is decorated like no other I've ever seen, with hundred of small columns of marble and lava, each individually and elaborately decorated and then topped with a carving depicting biblical scenes and stories. One could go around and around and around and never tire of looking at them, which perhaps was the plan for the monks? If I had not even entered the cathedral, I would left as a happy camper after seeing the cloister only. If you go there, DO NOT MISS IT! And take a digital camera or rolls and rolls of film. I actually met a mosaicist in a small shop behind the cathedral. Angelo Cangemi is a retired teacher. He and his wife are mosaic artists, and in their shop you can buy their work, postcards, books, and all the materials and tools you need to start making mosaics yourself. We had a limited conversation in Italian, but he gave me a two cards and video about the cathedral as gifts when I showed so much interest in the art. I even bought a tiny kit to try it out. I probably won't be decorating cathedrals, but a table top or two would be good when I retire. Or maybe sooner?